With summer around the corner here is a easy summer dessert recipe. Can I start by saying how much I love strawberries. They are hands down my house favorite. When the season is in full bloom, strawberries become a house staple. So now the question is what else can you do with strawberries? – Introducing, Strawberry Pops – easy, kid- friendly and elegant summer dessert. We always have a lot of summer parties and that only means one thing – FUN for ALL. With summer dessert recipes, I confess, I tend to take shortcuts for dessert, usually it’s an easy dumpcake or dessert shells filled with fruits and whipped cream or store bought ice cream or in summer it’s everybody’s favorite – chocolate covered strawberries. 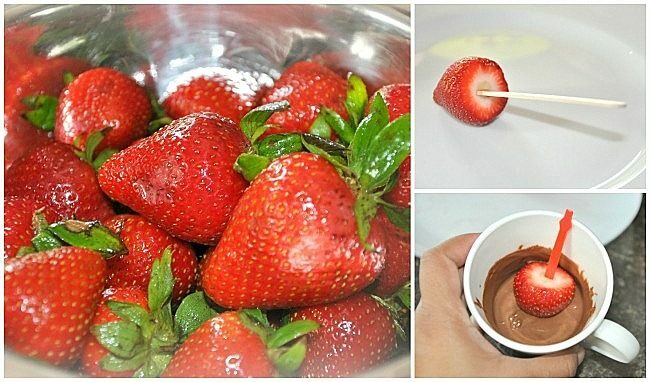 While most summer desserts are served in a bowl and need a spoon, chocolate covered strawberries are a 1 bite food for adults but for kids its a messy eat. So, I did what I should have done a long time ago – PUT THEM ON A STICK. I trimmed the berries and discarded the leaf/stem. Then I chilled in the refrigerator for 15 minutes. In the mean time I melted the chocolate in the microwave. I do 10-15 seconds at a time. You don’t want to burn the chocolate. Then I took berries out and inserted the craft sticks into each and dipped them into the chocolate and gently tapped off the excess. Do not stir them around or you’ll lose the berry into the chocolate. 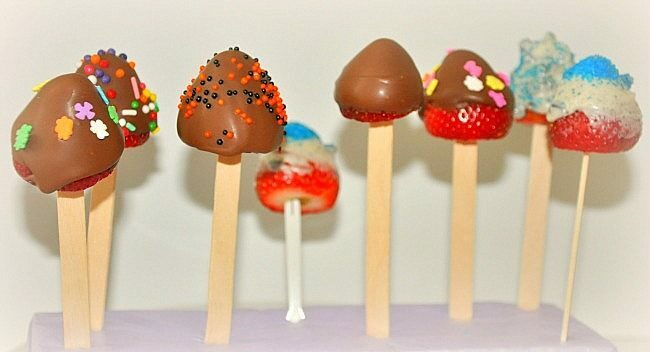 You can also chooce to dip the craft stick into the chocolate before inserting into the strawberry for a firmer hold. Remember to put the berries back in the fridge to harden up if you choose to do that. 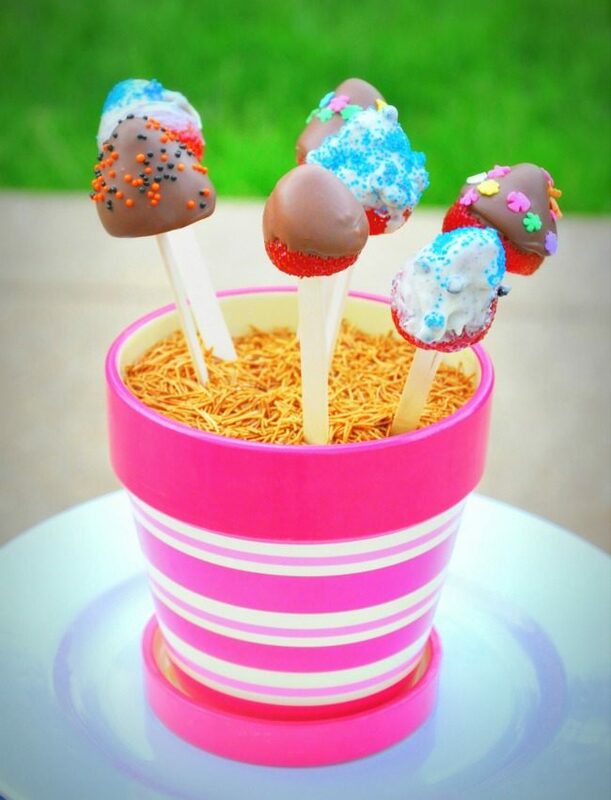 While the chocolate is still wet, sprinkle with funfetti like you would on a cake pop. Place on a styrofoam block to harden up. 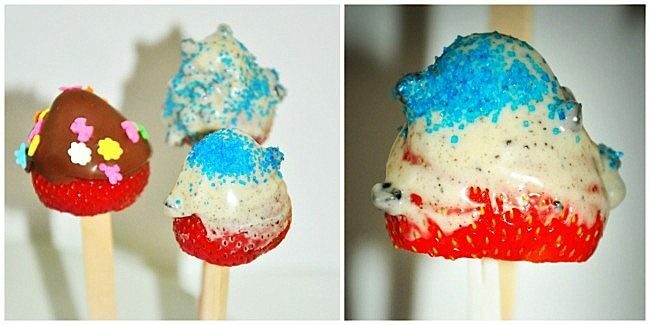 We created a few Red, White and Blue berries a preview for the July 4th party. Berry pops any day better than a cake pop and were definitely a hit with the YOUNG kids and the BIG kids. Once dry you can choose to serve it on a platter or in a pot (fill it with styrafoamand cover it with water beads or colored rice or colored pasta). For a visual treat, that’ll make your guests go -oooooh ! This easy to make summer dessert will sure become a conversation piece with your dinner crowd. Enjoy and tune in for more summer party ideas. Click on the link for more Kitchen Tales. Those look delicious! They would be cute for a number of parties! I think after you find the right theme, finding the decorations and games is the best step to take next. I have found it helps people to have more ease with the rest of their planning once they figure those things out. 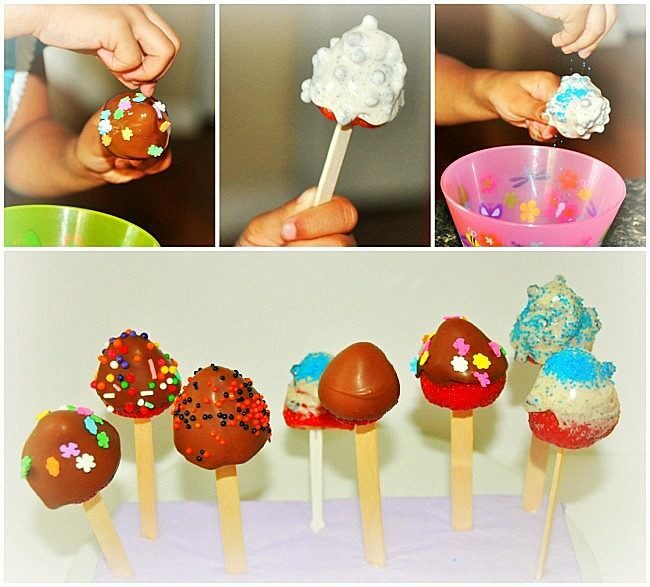 What a great (and more healthy) idea than cake pops (which my kids go crazy over)! Thanks for the idea!! I’m soo pinning this to my party idea board! Thank you! These are so much easier to make and tastier than cake pops(which my kids too are crazy about)! !